Darmec Technologies S.r.l. deals with the development, and production and a great care of the design of a wide range of Ground Support Equipment entirely made in Italy, featuring top-quality products that combine reliability, efficiency and safety to lower costs of maintenance. Darmec products are present in almost all the major Italian airports and in many European and worldwide airports. The high experience of Darmec team allows us to offer high quality products which are in constant evolution and allows us to take the best and up-date technologies on the market, and to manufacture a product that meets the customer’s needs in full. Darmec offers maintenance, repair, overhaul and sale of spare parts. Darmec offers a wide range of self-propelled and towed conveyor belt loaders available either in electric or diesel power whose range of operation can be used on any aircraft. Provided by a “scissor shaped pantograph” that improves positioning at height (lift). 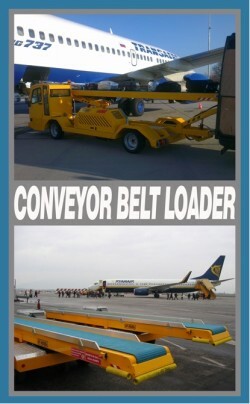 Thanks to a fifth motorized wheel used during the alongside approaching phase maneuvering the aircraft driven approach of the toed conveyor belt loader are facilitated. The devices equipped by modular acetal resin carpets with elastomer grip surface that ensure higher performance and do not require tensioning and alignment. The electric supply devices use a dual control unit (one in charge of vehicles’s traction and the other to pump management services) that significantly reduces energy waste. All models are made in electric drive mode that provides high levels of autonomy and reliability for the environment. 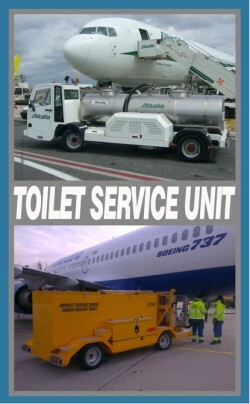 Darmec offers for self-propelled models a wide range of Toilet Service Unit with tank capacity of respectively 1250 liters (waste) + 650 (blue disinfectant water), and 2000 liters (waste) + 1000 (blue disinfectant water) and for towable models offers Lavatory Servicing Units with tank capacity of 1250 liters (waste) + 650 (blue disinfectant water). The devices usually have a static platform (only self-propelled models) with control console that allows a complete management. On demand, machines can be equipped with a lifting platform that provides a range of variable efficiency according to customer needs to the aircraft type. 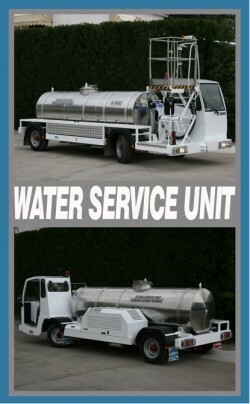 Darmec offers a wide range of Potable Water Units with water tank capacity, respectively, for 2000 and 3000 liters for self propelled models and with a capacity of 1000 and 2000 liters for towable models. An automatic system, with manual, provides maximum operator safety by preventing , pressure remains within the pipe connection at the end phases of refueling aircraft. Hanks to a self-cleaning filter in quartzite the devices not require additional circuit maintenance. Darmec’s machines usually have a static platform with control console that allows a complete management. On demand, machines can be equipped with a lifting platform that provides a range of variable efficiency according to customer needs and to the aircraft type. The devices usually have a static platform with control console that allows a complete management. On demand, machines can be equipped with a lifting platform that provides a range of variable efficiency according to customer needs to the aircraft type. Darmec offers a wide range of self-propelled and towable parallelogram passengers stairs suitable for aircrafts with a range between 1800mm and 4000 mm. 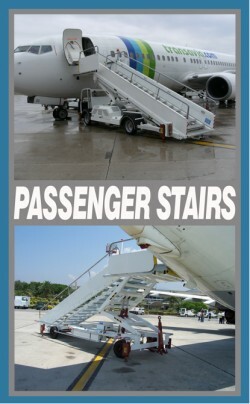 Thanks to a fifth motorized wheel used during the alongside approaching phase maneuvering the aircraft driven approach of the towed stairs are facilitated. Variable geometry that provides a wide range of operation while maintaining a comfortable Step height and Step tread.